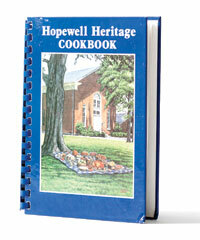 This pineapple pound cake from the Hopewell Heritage Cookbook is the perfect sweet treat for any gathering. Cream together butter, shortening, and sugar. Add eggs, one at a time, beating well after each addition. Sift together flour and baking powder. Add flour mixture alternately with milk. Add pineapple and vanilla. Mix well. Pour into a 10-inch, greased, floured tube pan. Bake at 325°, checking after 1 hour and 10 minutes. Cake is done when it begins to pull away from the pan and turns golden brown. Turn out immediately, add warm topping, and cover. The cake is better after it sits for a couple of days. Combine ingredients, heat, and pour over warm cake.